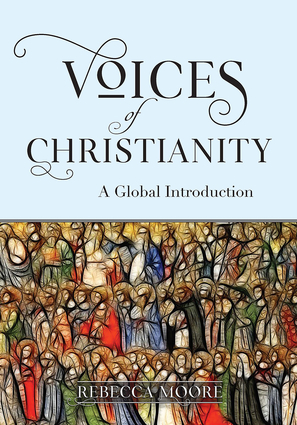 Voices of Christianity presents the key documents that shaped the history of Christianity. The story is told through the struggles, events, and achievements that contributed to its beliefs. Early chapters describe the Jewish roots of Jesus and Paul, present the theological decisions made by early Christians, and describe ways of being "religious" in the Middle Ages. Later chapters investigate the responses to the Reformations of the Sixteenth Century and address Christian reactions to the challenges of Enlightenment Rationalism. The last two chapters look closely at world Christianity in its global setting. Rebecca Moore is Professor Emerita of Religious Studies at San Diego State University. She has a Ph.D. in Religious Studies from Marquette University. She co-authored the book A Portable God: The Origin of Judaism and Christianity (Rowman and Littlefield 2007). She is past president of the Society for the Study of the Bible in the Middle Ages.